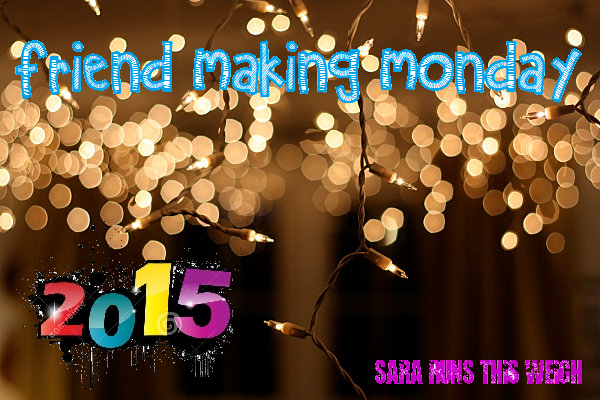 Sara Runs This Weigh: Friend Making Monday: Happy New Year! 1. How did you celebrate the New Year? I volunteered to work overtime on the overnight shift, so I worked, otherwise it would have just been my usual: home alone with a cheap bottle of champagne, watching the Rockin’ New Year’s Eve with Ryan Seacrest. I’m not really a party person…well, at least not the kind of parties that happen on New Year’s Eve, anyway. Those things can get pretty crazy. 2. How was 2014 for you? Give us a run-down/review of how 2014 went. I ran 19 organized races and 6 virtual races this year. As a result, I earned 19 medals and a couple gift cards that I used to buy a new pair of running shoes. I placed 2nd in my age group at one race. I ran a number of races for the second year in a row (Stand-Up 5K, Autism Speaks 8K, BunRun -- last year a 10K, this year a 5K, Run With The Heroes 5k, Brown Santa 5K). I also ran some other races that I want to make annual repeats (Austin 10/20, Freedom 5000, Hot Chocolate 10K, Austin Halloween Half marathon, Turkey Trot). I trained for and ran my first full marathon and loved it. I visited my home state of Oregon for the first time in 5.5 years and got to see my grandpa before he passed away shortly after my visit. I logged 960.75 miles for the year, blowing my goal of running 900 miles out of the water completely. I bought a new car. I paid off some credit cards. I built my credit a little bit. I worked a bunch of overtime again, just like 2013. Overall, 2014 was a success. 3. Did you make any resolutions and/or goals for 2014? What were they? Yes I did. However, I apparently didn’t blog them, so I’m going to try and remember them to the best of my ability. • run at least 900 miles. • complete a full marathon. • get back down to 172 lbs. • workout 3-4 days a week. 4. How successful were you with keeping with these resolutions and/or goals? Meh. I definitely did the 900+ miles and the marathon. However, I yo-yo’ed with my weight and never did make it back down below 180 lbs. I think most weeks, I did get the 3-4 workouts done (or at least 3-4 runs), but there were weeks where I only did 1 or 2 and a few where I did nothing at all. So, I’d say about halfway successful…BUT the things I did succeed at were pretty awesome. 5. Did you revise your list of resolutions and/or goals partway through the year? If so, what did you change? Not really. I was just trying to keep up with what I had laid out for myself. 6. Are you making any resolutions and/or goals for 2015? What are they? Yes, I have a few specific goals I would like to achieve. • run 2 more marathons before March 14th and achieve Marathon Maniac membership. • run another marathon later in the year (maybe…if my Ireland trip falls thru, I will try to run the Vegas RNR full). • run 3 half marathons within 90 days and achieve Half Fanatic membership. • run at least 5 half marathons. • run at least 1000 miles. • complete a sprint triathlon. • get down to 170 lbs or less. • practice clean eating at least 80% of the time. 7. If you could change one thing about what happened in your life in 2014, what would it be and why? Not open so many credit card accounts. Oops. 8. Did you do anything in 2014 that you have never done before? 9. Do you have any hopes of doing something in 2015 that you have never done before? 10. If anything were possible and you had no restrictions, what would you like to do in 2015?